Veganism is becoming more and more popular as the years go on, with millions around the world enjoying a diet free from animal products. However, there are some common misconceptions about the vegan lifestyle – the main one being that vegans eat boring stuff all day, and are miserable for it. This couldn’t be further from the truth. It’s not all salads and radishes, you know! 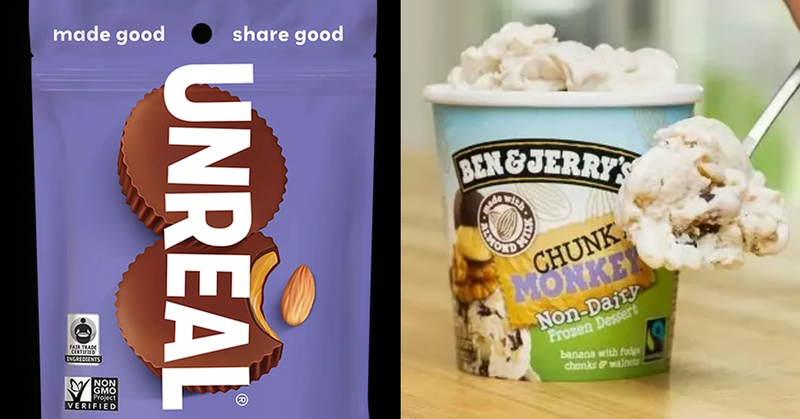 Vegans love to pig out on junk food just like the rest of us, and even the omnivores among you will want to try a few of these junk food treats. These things are delicious. I’d specifically recommend the chewy lemon pie variety. Oh, and if you get addicted, it ain’t my fault! If you want something savory to snack on, you could do much worse than getting a bag of these, maybe with some ketchup on the side. Yummy. Most of you will have tried millionaire’s shortbread. With its multiple layers of sweetness, it’s hard not to like. What might surprise you is how these vegan alternatives taste just as good! Vegan meat substitutes seem to get closer to the real thing as the years go by. I honestly can’t tell the difference when I’m chomping on these fake chicken nuggets, and it makes me feel a little better that no chickens have had to suffer. There are a lot of different potato chip products that are vegan, but the manufacturers don’t always make a big fuss about it. Sometimes, they might not even know! These green onion chips are a great snack for vegans and non-vegans alike. Is there a single person out there who doesn’t like strawberry twizzlers? I mean, there might be, but I don’t ever want to meet them. They might have the word ‘cheddar’ on the box, but these bad boys contain no dairy whatsoever. They are, however, ridiculously moreish. A great study snack, but remember – just because they’re vegan, doesn’t mean they’re healthy! A great bar snack for vegans. I guarantee most people wouldn’t be able to tell the difference between this and real jerky – especially after a few beers! Candy Kittens are a British brand of candy, specializing in vegan treats. Having tried these, I can assure you that everyone with a sweet tooth will enjoy them, whether they are vegan or not. These are the ultimate decadent vegan ice cream treat. Be warned – they come in boxes of 4, and you could easily find yourself eating all of them with very little effort. Mac & Cheese is the ultimate American comfort food, and takes us back to childhood whenever we have it. Thanks to Daiya, vegans can indulge in a bowl of Mac & Cheese without sacrificing flavor. Okay, I’m obviously not encouraging you to eat this ultra-sugary biscuit spread out of the jar – that’s pretty decadent. All I’m saying is that God gave us all free will, and I’m not going to judge you if you do. Another savory vegan treat of the cheesy variety. Absolutely divine with a guacamole dip, as pictured on the packaging. Get a packet in for the next big game night! These are almost too good to be true, and vegans can scoff them down guilt-free. They’re also Fair Trade certified! I must confess – I had no idea this banana-based flavor of Ben & Jerry’s had a vegan variety! I have, however, eaten a whole tub of it to myself. Many times. Only God can judge me. Did we miss any of your favorite items out? Let us know in the comments!